Are there any options to the lengthy process connected with splinting and the problems resulting thereof? What type of anesthesia does this procedure require? How come this method is not applied as a routine procedure? Is it not possible to stitch up the extensor tendon above the distal interphalangeal joint? How does one treat an open extensor tendon injury above the distal interphalangeal joint? Some surgeons use a rigid wire (K-wire) to immobilize an extensor tendon injury in a distal phalanx by piercing the wire into both, middle phalanx and distal phalanx. This represents a very reliable method to immobilize the distal interphalangeal joint. The wire will be removed six weeks after the intervention. The wires only temporarily and for a period of six weeks immobilizes the distal interphalangeal joint. The wires may be pierced from the middle phalanx into the distal phalanx or also through the fingertip. In most cases a simple finger anesthetization – an Oberst block – will suffice. When removing the wire/s the same approach has to be taken as far as the anesthesia is concerned. This procedure represents only one option that occasionally is being practiced. The potential risk of infiltrating bacteria penetrating the distal interphalangeal joint in depth through the wire thus causing a severe infection within the joint, cannot be excluded even if it does not happen to frequently. 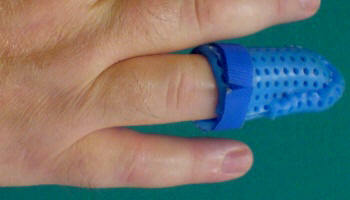 This risk is not given when using a stax finger splint to immobilize the injured digit. Actually this used to be common practice with ruptures which occurred subcutaneously in addition to applying a stax finger splint. This rather complex approach could however not compete against those cases where a conservative treatment was selected to treat extensor tendon ruptures because the results many times were not better at all and in addition not few patients suffered from complications tied to this procedure. Infections in the distal interphalangeal joint, secondary tearing of the extensor tendon and a rather long-lasting discomfort are just a few examples that speak against this option. An open transection of the extensor tendon above the distal interphalangeal joint always constitutes a compelling necessity to surgical treatment. In most cases the entire arm needs to be numbed. This method of anesthetization of the arm (brachial plexus block) allows to create a bloodless surgical environment within the injured finger and the entire hand (with the help of a cuff) thus enabling the surgeon to precisely identify the broad but thin extensor tendon. During surgery the distal interphalangeal joint at first is immobilized through a rigid wire (K-wire). The next step is to suture the tendon and in most cases also the articular capsule of the distal interphalangeal joint, located right underneath the tendon. This procedure requires the removal of the K-wire after approximately six weeks. The removal however can be executed with just a simple Oberst block. After surgery on an extensor tendon it may additionally be necessary to immobilize the distal interphalangeal joint of the injured digit. This can be achieved with the use of a stax finger splint. There are however other splinting approaches which have also proven to be effective in treating an extensor tendon injury.